Trash by Andy Mulligan. Grades 8+ David Fickling Books, 2010. 231 pages. Review copy provided by my local library. Surrounded by crushing poverty, Raphael, Gardo, and Rat eke out a living by sorting through massive trash dumps. Most of what they find is, well, stuppa. But one day, they find something spectacular - a key that starts them on a treasure hunt. The payoff will be huge... if they're brave enough to follow through. 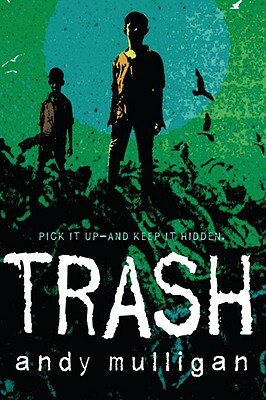 A riveting and eye-opening mystery, Trash is an accessible story that won't soon be forgotten. It's set in an unnamed Any City where poverty and political corruption go hand in hand. Caught in the crossfires are the children, left sifting through the trash for anything they can sell to support their families. School's an afterthought - what's a trash boy going to do with an education? - and there's never enough food or clothing to go around. With politicians stealing aid money and taxes, the cycle seems unbreakable. The story is told in alternating points of view, shared between the three trash boys and a few others who step in to help along the way. I appreciate the subtle differences between the narrators and I liked getting bits and pieces of the story from some outside eyes. Short chapters keep the action moving and the mystery was a compelling one. As the boys try to figure out what has been hidden and who it belongs to, they're hounded by corrupt police and constantly face the need for bribes to grease the wheels. Of course, some students know that all too well, but for others this is going to be an eye-opening story. Trash sat on my to-read pile for longer than it should have. Honestly, the cover turned me off, even though it's appropriate for the story. I thought it was going to be too dark, too depressing. Now, if my copy had the British cover (pictured at right), I would have picked it up straight away. While the US cover portrays the desolation of crushing poverty (definitely a major theme in the book), the UK cover portrays the ultimate feel of the story, which is hope for the future. I do think the US cover may appeal more to teens, while the UK cover looks younger. Check out more reviews at Biblio File and Book Nut (bonus: interview with Andy Mulligan).